As a fantasy football guy I might have learned one or two things. 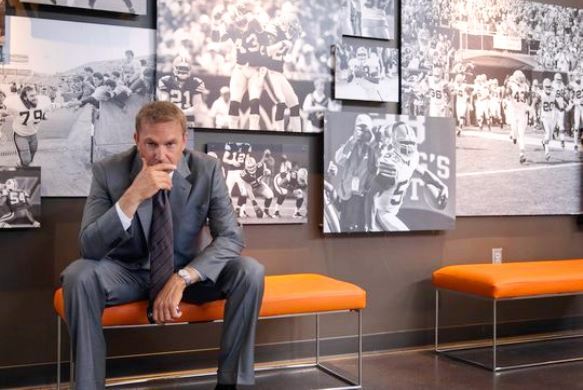 Draft Day is a day in the life, ticking down from the clock thriller built around the NFL Draft, with occasional smart insight into the team office. There are definitely some extraneous elements that don’t belong here, such as Kevin Costner’s character dealing with his girlfriend’s just announced pregnancy, and the death of his father two weeks back. A few wasted minutes here and there don’t particularly tarnish what is essentially an entertaining football fan movie. 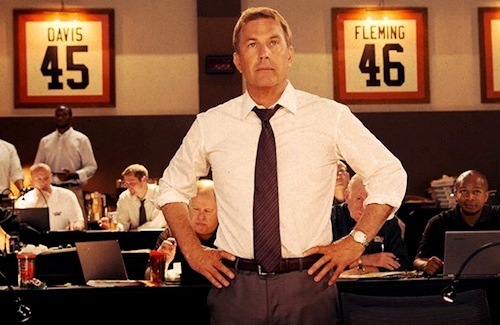 Costner is Sonny Weaver, team manager for the eternally misbegotten Cleveland Browns. The Seattle Seahawks have just offered him a provocative deal with thirteen hours to go before the draft: He gets their number one pick in the first round in exchange for three years of future draft picks. Bo Callahan (Josh Pence) is the cocky and egocentric QB hot prospect, but Sonny sees him as a boom-or-bust player. Sonny would prefer Vontae Mack (Chadwick Boseman), an eager beaver and level-headed middle linebacker. But the team owner (Frank Langella) demands for Sonny to make a splash, or face being fired. If Sonny makes any bland and mundane moves than the whole Cleveland fan base is gonna hate him, too. 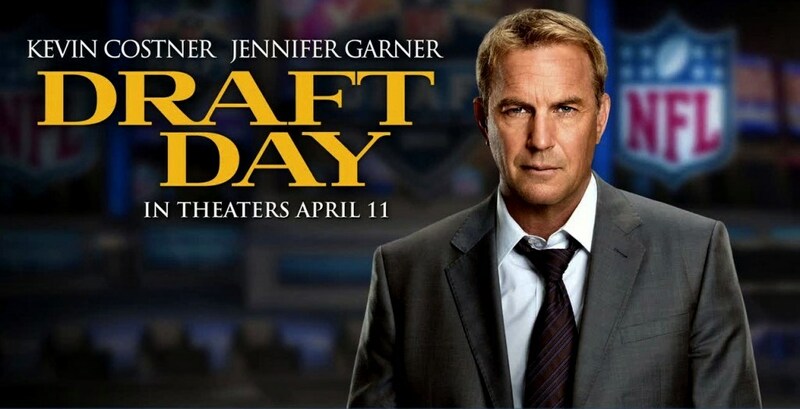 I wish “Draft Day” was as rigorous, and frankly brilliant, for an inside football movie as “Moneyball” was for baseball. It goes for tabloid sensation depth basically. I did get the feeling though that all the talk shop exchanges between Costner and everybody else (the team owner, the head coach, the analysts) are truly accurate. He calls prospective players for informal over the phone interviews. Wouldn’t you know it? Callahan routinely gives dopey, immature answers. I only wish everybody else talked faster in this movie or overlapped each other’s sentences with some kind of intensity. “The Wolf of Wall Street” had a frenzy when it came to people talking over each other. But this is an archetype Costner movie – laid-back, introspective, pensive, contemplative. 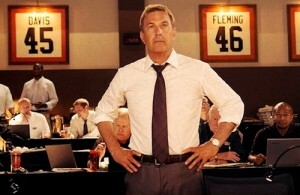 Costner, when it comes down to the final pressure-cooking, wheeling-dealing with multiple teams (yea! ), is both shrewd but laid-back gentlemanly about it. To add some flash, director Ivan Reitman (“Ghostbusters,” “Dave” fame) uses split-screen techniques and ESPN style stadium overhead shots plus graphics, and refers to real football teams that exist (“Any Given Sunday” had made-up team names). All the rookie prospects are made-up in this script, but at least the movie made everybody distinguishable and I always knew who Costner was talking about. When it’s all said and done, “Draft Day” is a well-played juggling act. Also on-board: Denis Leary as the head coach, Jennifer Garner as the girlfriend and coincidental team cap salary manager, Terry Crews and Sean Combs as sports agents, and last, Ellen Burstyn and Rosanna Arquette as (get out!) intrusive family members. Film Cousins: “Any Given Sunday” (1999); “Two for the Money” (2005); “Moneyball” (2011); “Trouble with the Curve” (2012).